The Insurance Institute for Highway Safety (IIHS) has awarded the 2013 Nissan Altima with its "Top Safety Pick Plus" designation under its new, more stringent criteria for model years from 2013 forward. The new testing requires that the car not only pass the front, side, rollover and rear crash tests (which earn a "Top Safety Pick" designation), but also a new small overlap frontal test to gain a "Plus" on their rating. The 2013 Altima previously won a 5-star safety rating from the National Highway Traffic Safety Administration (NHTSA) in its New Car Assessment program. "Driver and passenger safety are top priorities for Nissan, which is why we make features like Safety Shield technologies available," said Bob Yakushi, Nissan's director of product safety. 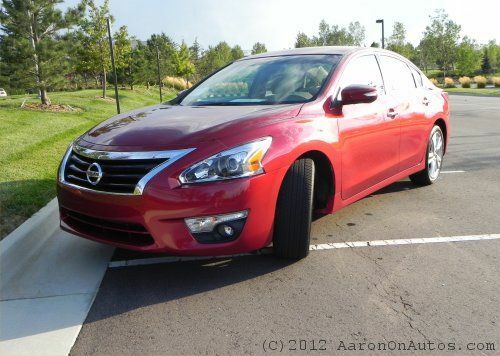 "The 2013 Altima is truly Nissan's most innovative Altima ever, and the 'Top Safety Pick Plus' designation by IIHS reflects the engineering and design that have gone into this car to make it stand out in the class." Standard safety features on the 2013 Altima include the Nissan Advanced Airbag System (driver and front-passenger seat-mounted side-impact supplemental air bags, roof-mounted curtain side-impact supplemental air bags), Vehicle Dynamic Control, 3-point ALR/ELR seat belt system, LATCH System (Lower Anchors and Tethers for Children), zoned body construction with front and rear crumple zones, and Tire Pressure Monitoring System with Easy Fill Tire Alert (honks horn when tire being filled is inflated to recommended pressure). Added features can include next-generation Safety Shield technologies: Blind Spot Warning, Lane Departure Warning, and Moving Object Detection systems using the single rear camera. The 2013 Nissan Altima is in showrooms now with a starting MSRP of $21,500. Torque News went hands on with the 2013 Altima earlier this year.